Jack Rochier on attack with Isiah Rademacher in support. Reid Neureiter photo. The first minutes of the match saw strong defense from Monarch forcing mistakes and penalties from East. However, Monarch struggled at the lineout and were unable to maintain possession. Ten minutes in Monarch began a sustained period of attack. After East missed touch on a penalty, then gave up a penalty on the 5-meter line, Monarch's scrum half Landon Coleman scored under the posts. The conversion kick was charged down—quite the rarity—and Monarch led 5-0 with 18 minutes played. Just after the restart, a deep Monarch kick from flyhalf Nate Nivens was poorly fielded by East resulting in a turnover and try. Monarch missed the conversion and led 10-0 with 20 minutes played. Monarch again kicked from the restart, though this time East countered successfully and after a few phases No. 8 Grant Pullen stormed through the defense to score for East. Liam Peck made the conversion and the score was 10-7 with 23 minutes gone. Peck would score again at the 29 minute mark after Isiah Rademacher turned the ball over and East's phase play opened up gaps in the Monarch defense. Peck converted his own try to give East the lead 14-10 at halftime. The second half began with a number of handling errors from both sides, preventing any continuity or sustained attack. But after eight minutes, East outside center Charlie Bennett intercepted a pass near midway and sprinted towards the goal line. He was caught just short, but Monarch's high tackle resulted in a penalty try and yellow card. 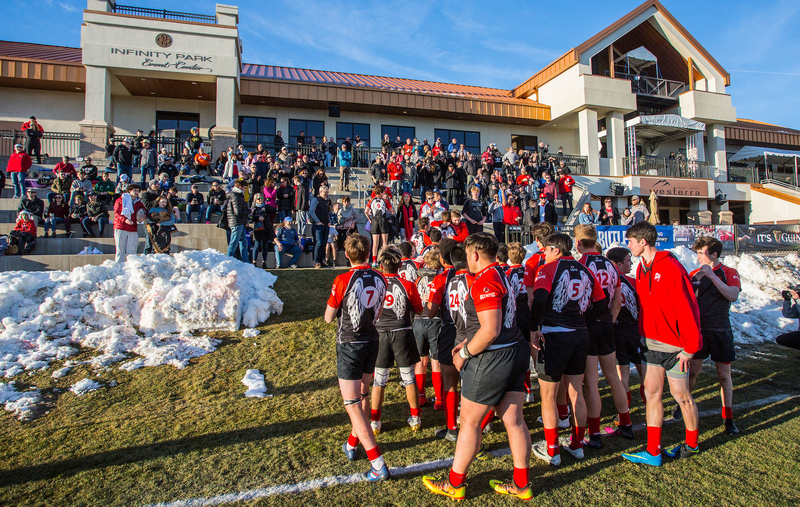 It was a defining moment in the match and East led 21-10. Despite being down a man, Monarch dominated the next five minutes but could not break through East's defense. With 16 minutes played, East received a yellow card for pulling down in the lineout. Monarch quickly capitalized with a try from prop Calvin Williams following yet another East penalty on their 5m line. The conversion was missed and East led 21-15. Monarch was unable to score any more points with the man advantage and East sealed the match with a try from wing Ben Gottesfeld at the 30 minute mark. Peck made his third conversion and the final score was 28-15. "Our boys continue to show maturity and character this season," said East HS Coach Josh Tafoya. "However, if we want to continue experiencing success, we need to improve our decision making with the ball and reduce the mental lapses that are leading to penalties." East is now 3-0 in league play, Monarch is 1-1.